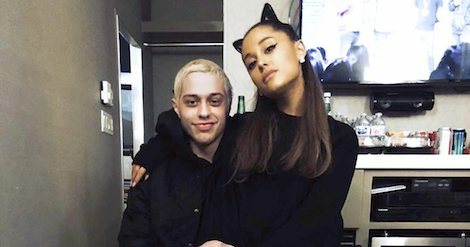 Just over a week ago, the news of Ariana Grande and Pete Davidson breaking up hit social media, and people everywhere were shocked. Although, the news didn’t come as much of a surprise, as the couple went from 0 to 100 reaaaal quick. From moving in, to pet pigs and engagement after just five months of dating, it was never going to end well. And although the two love birds thought that they were as happy as can be, reality hit. After a number of devastating events, the two decided to call it quits, and subsequently called off their engagement. After the many reports of the two breaking up over the past week, it was only speculated to be a rumor. However, there have been more signs pointing towards the rumors being true. From Ariana not wearing her engagement ring, to Pete Davidson covering up his dedicated tattoos, it all became clear that it was over. Davidson, who is a popular comedian on Saturday Night Live, performed as the co-host on Saturday night for a comedy show at the Largo in West Hollywood with director Judd Apatow, called Judd & Pete for America. As Pete started to open up the comedy show, he began with a self-deprecating joke, saying, “Well, as you could tell, I don’t want to be here.” As the crowd chuckled along awkwardly, Pete went on to say, “Does anybody have any open rooms? Looking for a roommate?” It’s good that Pete is able to joke about the break-up so shortly after, but they always say that people cover up sadness with humor. Great sense of humor. We all want to be happy, find the right person & its ok. Next time just take it slow. Wow, tough break for Pete. Although Ariana hasn’t spoken publicly about the break up just yet, we can imagine that she is hurting just as much. Do you think Pete was brave to joke about the breakup so soon? Do you have any rooms going for Pete to move in? Let us know in the comments, or on Twitter at @WhatsTrending. VIDEO: Little Kid Just Wants Alexa to Play Baby Shark!